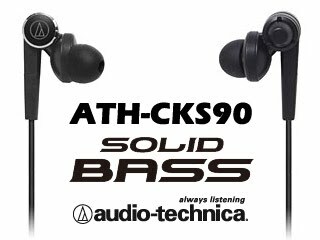 Audio-Technica introduced a new model of their Solid Bass series, the ATH-CKS90, to the market. It will has a slightly larger transducer then the previous ATH-CKS70 (13mm vs. 12.5mm) and a redesigned 'double chamber' (the rounded section where the logo is) which AT claims to give even better (SOLID-er?) bass response. MSRP is estimated to be US$135, which is quite a jump from the US$97 (MSRP) CKS70. A red limited edition and one with active noise cancellation will also be available. CKS90 should hit the market by end of next month. On a side note, I will be reviewing the CKS70 in near future.